Jeremy Renner’s Hawkeye has appeared in approximately 20 cumulative minutes of the Marvel Cinematic Universe and is not a girl, ergo journalists and concerned mothers everywhere want to know: Isn’t it about time he settles down with a nice solo franchise of his own? 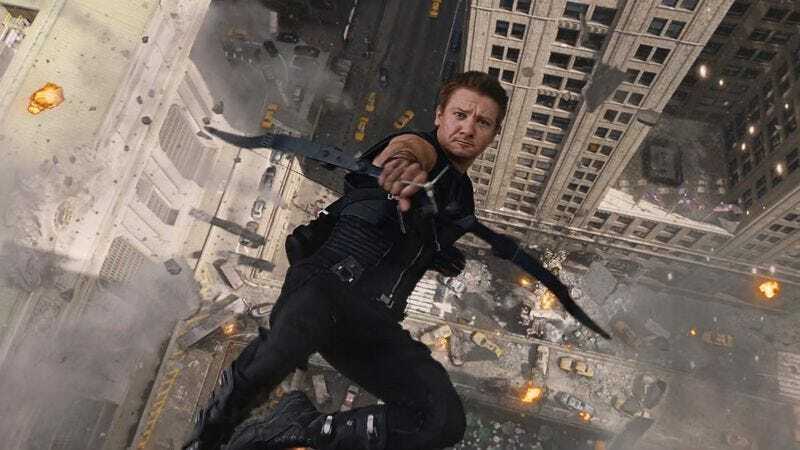 MTV News recently posed that question to Renner, reminding him that Hawkeye’s role was drastically reduced in The Avengers—something Renner says The Avengers 2 compensates for “tenfold”—and asking whether he’d ever want to go it alone someday, in a movie where that sort of thing couldn’t happen. “I’m happy to be in the ensemble. I’m not scratching or clawing to do a solo movie by any means,” Renner said. He then added, “I think he’s a utility guy that can bounce around into other people’s universes a little bit, especially like Cap 3”—turning to the camera and giving it the sort of exaggerated wink usually reserved for Mentos commercials and mischievous cartoon mice.